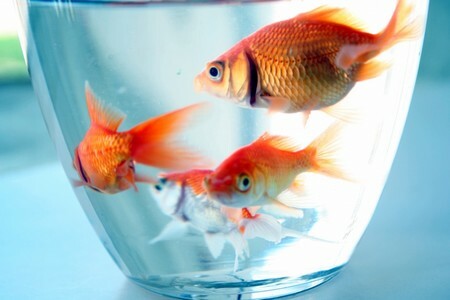 Many people believe that feeding goldfish is the simplest part of the fish care process. However, this is not the case. Goldfish are one of the most common breeds to die from excessive overfeeding. Overfeeding your goldfish may cause them to eat themselves to death, though may also result in bacterial growth from uneaten food. Here is a guide to help you understand how to feed goldfish. Right Food: Many people mistakenly believe that all fish food is the same. However, goldfish often do much better when fed a diet specifically designed for their breed. Goldfish specific food usually isn’t that expensive, and is available at most pet supply stores in the “fish care” section. A goldfish will be much healthier if you add some variety to its diet. This can be accomplished by using live food (such as brine shrimp or blood worms), or leafy vegetables. When feeding your goldfish live food, be sure that the food that you purchased is from a reputable source. Low-quality live food may contain bacteria, which may harm your fish. While live foods are welcomed by goldfish, the parasites that come with them may infect your fish. If bloodworms, tubifex worms, brine shrimp or the like are to be fed, it’s best to raise them on your own. Otherwise, buy them from a reputable shop. Flakes are plenty in the market. Buy a good quality goldfish-specific brand. The higher the protein percentage, and the greater is the variety of ingredients in it, the better the quality. Pellets aren’t so hot for goldfish. They absorb water and expand in stomachs, leading to indigestion, constipation and even Swim Bladder Disorder (in which case you should stop pellet feeding totally). If you have to, soak the pellets in tank water first for five to 15 minutes. Freeze-dried and frozen foods make nutritious supplements without introducing disease into the tank. Schedule Feeding Times: In order to prevent your fish from overeating, try to schedule two feedings per day. You should try to adhere to a standard time for these feedings as much as possible, since it will help your fish to get into a routine. Once your fish realize that each mealtime occurs at a set time each day, they will be less likely to overeat. Clean The Aquarium: In order to prevent excess food from lowering the quality of the water in your aquarium, it’s highly recommended that you clean out any debris on the bottom of your tank. This cleaning should take place on a weekly basis, and can be done with a small water siphon hose to remove the debris.